To be a hero is an incredible feat. Role models and idols inspire, but a hero has a uniquely brave quality that sets him or her apart from any other. A hero is defined as a person who is admired or idealized for courage. A hero is a man or a woman who risks his or her safety for the lives of others. Bravery and selflessness make a hero. In Orange County, Florida, two young boys became heroes when a mobile home nearly burned to the ground in late June of this year. 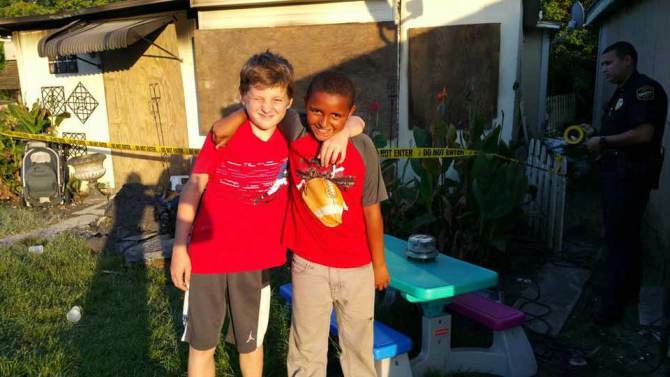 Isaiah Francis, 10, and Jeremiah Grimes, 11, faced the flames and smoke to save the small children inside the mobile home. The two neighborhood boys were doing what any young boys would normally be doing on a sunny afternoon: playing games. Their summer fun was quickly interrupted by an immediate and dire situation. Francis and Grimes were hanging out when Francis remembers smelling something. He looked out the window and saw the black smoke. Francis and Grimes proceeded toward the burning home and saved the kids before the firefighters arrived on scene. Francis tells reporters he wants to be a firefighter when he’s older and he’s certainly on the right track after courageously facing the fire firsthand. The boy’s courageous efforts may have saved the lives of the young children. Firefighters were able to rescue the other two children, who were sent to the hospital in critical but stable condition. These two boys may have grown up quite a bit because of this incident, as not many their age would have even considered stepping inside a burning home. At the end of the day, a mobile home may have been lost in the tragedy, but we’re glad everyone made it out safely thanks to the brave souls of two young boys. Need Help with your Mobile Home Roof? Having a roof over your head that’s reliable and long lasting is vital to ensure your mobile home is safe and comfortable for a long time. A leak free roof makes all the difference. Let our professional team make you feel at home with a beautiful new roof r by repairing the roof on your mobile home. Call us at 1.800.297.3758 or fill out a contact form to make your mobile home the home it deserves to be.